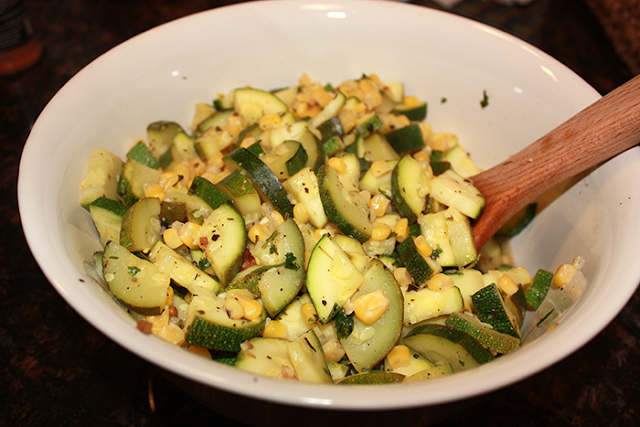 Today I thought I would share with you one of my easy summer side dishes. To me, this dish brings together some of the best flavors and colors of summer, and is perfect for a backyard BBQ or a easy weeknight side dish. I always start off by gathering all my ingredients and getting them into one place. Otherwise I'm running all over the kitchen looking for at least one that I've misplaced. Side note - I totally forgot to pack a can opener before we moved, and I opened the can of corn for this recipe with a spoon. I found the video on youtube - it can be done! 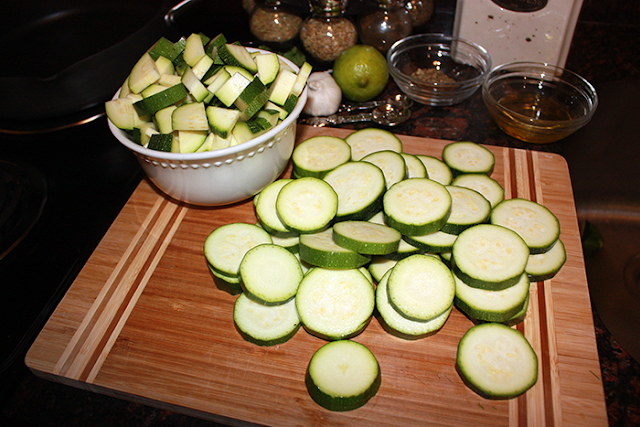 Once I've gathered everything I need, I start by first slicing my zucchinis, and then quartering the slices. The fastest way to do this is to slice them and then stack the slices to quarter them. The ones in the bowl have already been quartered and the ones left on the cutting board still need to be done. Another side note - please notice the dark counter tops - praise Jesus for no more white ones! 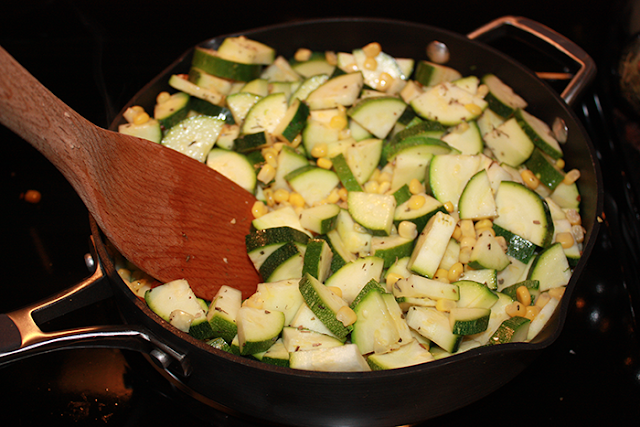 After I finish with the zucchinis, I mince the garlic while I heat my pan. Once the pan is hot, I pour in the olive oil and garlic until fragrant, or about 1 minute. 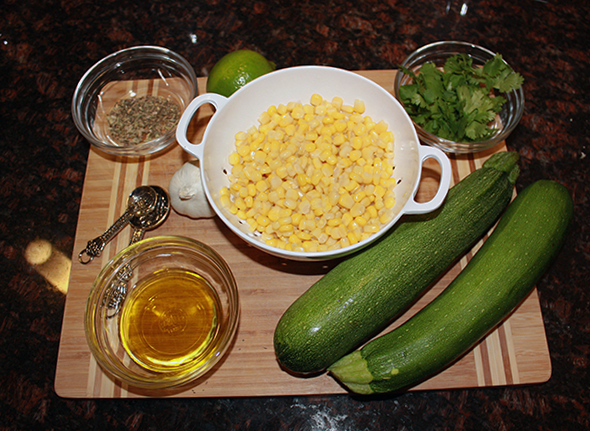 At this point go ahead and dump in your zucchini, corn, thyme, basil, and oregano. You'll let this cook for about 4-5 minutes, stirring occasionally. If you use a smaller pan like I did, you might need to let it cook a little longer - just keep an eye on it. 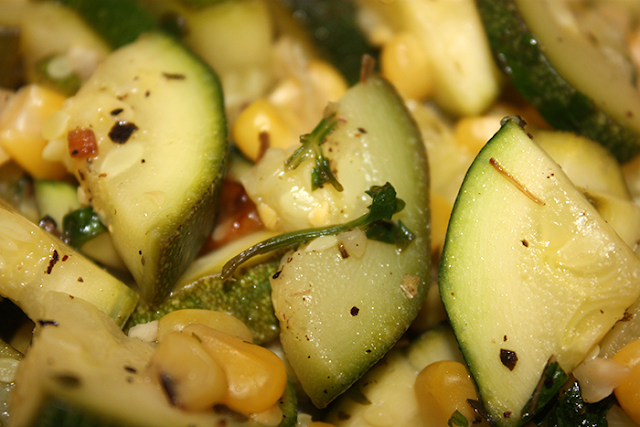 Once everything has cooked through, sprinkle your salt, pepper, cilantro, and lime juice over the mixture. Stir it up and then you're ready to serve! I served mine as a side to turkey burgers and it went together perfectly. Definitely a light, easy weeknight dinner. Enjoy!